Mrs. Julie Cummings is vice chair of the Max and Marjorie Fisher Foundation, headquartered in Detroit, Michigan. She has been a board member and chair of the board of the Council of Michigan Foundations, representing the family foundations in the state, and she also served as one of the founding commissioners of the Michigan Community Service Commission. She brings the perspective of an actively engaged, national-level volunteer to the understanding of Michigan’s philanthropic community. 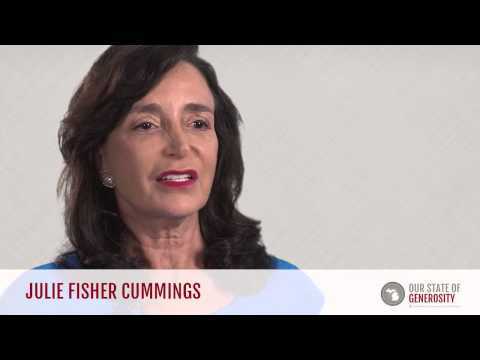 Ms. Julie Fisher Cummings talks about her career in philanthropy. 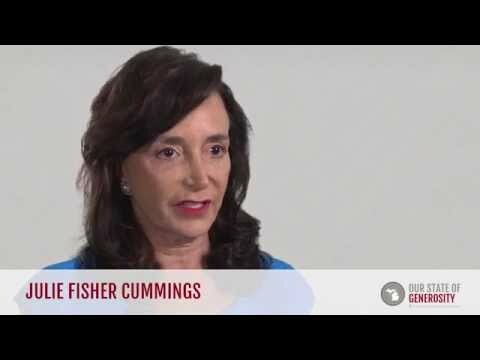 Ms. Julie Fisher Cummings talks about the remarkable leadership of Russ Mawby. 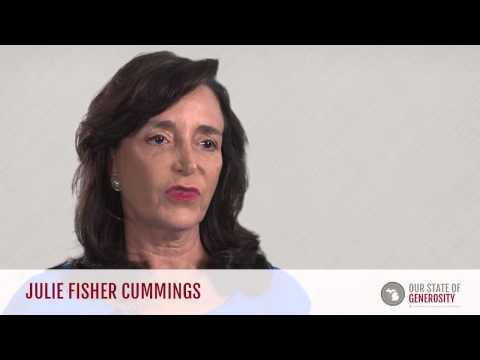 Ms. Julie Fisher Cummings talks about how family foundations are the "army on the ground" that see the value in investing in their local communities. Ms. Julie Fisher Cummings talks about the challenge grant and the movement to grow community foundations across the state of Michigan. Ms. Julie Fisher Cummings talks about how fundamental the Council of Michigan Foundations (CMF) has been to the growth and success of Michigan philanthropy. Ms. Julie Fisher Cummings talks about the value of "disagreeing without personalizing." Ms. Julie Fisher Cummings talks about how Michigan philanthropy has embodied an ethic of servant leadership. 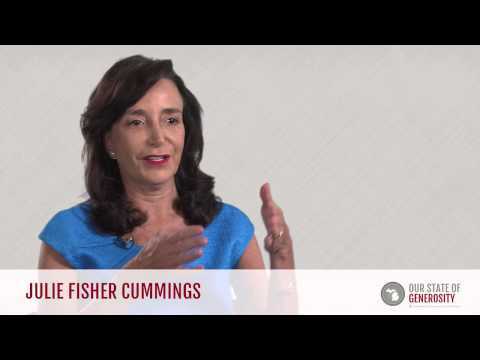 Ms. Julie Fisher Cummings talks about how all philanthropy is valuable and the importance of collaboration to ensure everyone has a good life. Ms. Julie Fisher Cummings talks about the importance of having volunteer infrastructure available to all. Ms. Julie Fisher Cummings talks about how important RAGS on the Hill was to the growth of Michigan philanthropy. Ms. Julie Fisher Cummings talks about the mutual respect shared by legislators and philanthropists at RAGS on the Hill. Ms. Julie Fisher Cummings talks about the founding of the Michigan Community Service Commission (MCSC). Ms. Julie Fisher Cummings talks about the Michigan AIDS Fund and her sister, Mary Fisher's, speech at the 1992 Republican National Convention. Ms. Julie Fisher Cummings talks about how she encouraged the implementation of youth advisory committees (YACs) in community foundations outside Michigan. 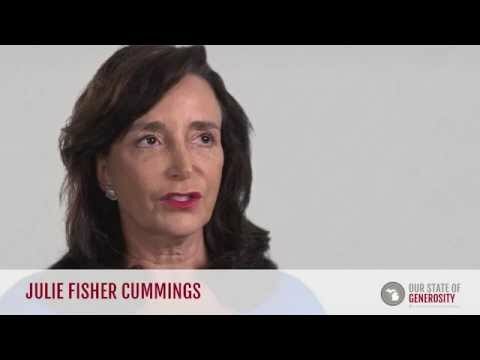 Ms. Julie Fisher Cummings talks about how she initiated conferences for family foundations to brainstorm how they could better work together. Ms. Julie Fisher Cummings talks about Michigan Community Service Comission (MCSC) initiatives to build volunteer infrastructure. 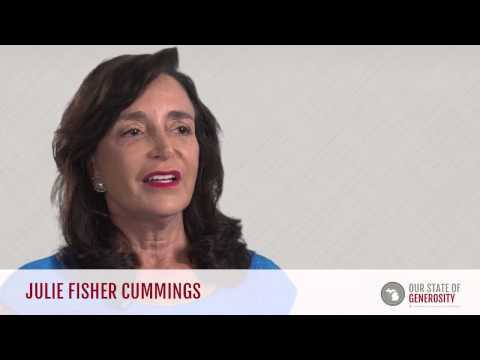 Ms. Julie Fisher Cummings talks about her experience serving as a board member for the Council of Michigan Foundations (CMF). Ms. Julie Fisher Cummings talks about the factors that led to Michigan's "golden age of philanthropy." 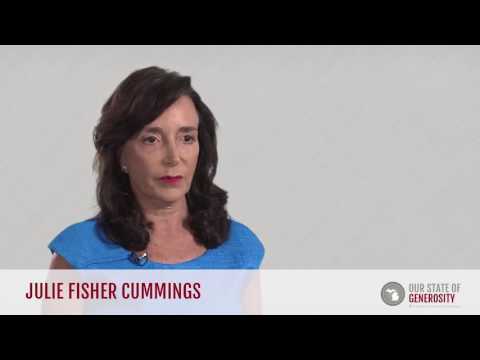 Ms. Julie Fisher Cummings talks about the remarkable leadership of Dottie Johnson. Mrs. Julie Cummings received her Bachelor of Arts degree in business and finance from Palm Beach Atlantic University in 1987, and her Master of Science degree in social work with an emphasis in social policy from the Columbia University School of Social Work in 2011. As a young adult, she moved to Florida where she became Chair of the Women’s Division of the Jewish Federation of Palm Beach County as well as Campaign Chair of the United Way of Martin County. This would mark the beginning of her long road of service in volunteering and leading within the nonprofit sector. “Those two, the Jewish ethic of service and United Way, being a great model of how you raise money and bring everyone into the fold, have really helped,” said Mrs. Cummings. Mrs. Cummings’ leadership in the field of philanthropy began with her appointment to the Michigan Community Service Commission in 1992 by Gov. John Engler. Mrs. Cummings served until 2001, during which time she served as a member of the executive committee and assisted in establishing the ConnectMichigan Alliance (CMA). She served as one of three CMA campaign co-chairs, helping to raise $10 million to support infrastructure development and to match a $10 million public grant from the state of Michigan. The ConnectMichigan Alliance was a new initiative that began in 2001 with the mission of promoting and strengthening a lifelong ethic of service and civic engagement throughout Michigan. It sought to build and strengthen Michigan communities by supporting existing nonprofits through promotion of volunteerism, advocacy and public policy, training and technical assistance, and direct programming. By housing all statewide volunteer and service-learning initiatives under one administration, CMA aimed to increase capacity and effectiveness while decreasing overall administrative cost and burden to support nonprofits. An innovative and collaborative initiative, it consisted of a partnership between Michigan Campus Compact, Michigan Community Service Commission, Michigan Nonprofit Association, and Volunteer Centers of Michigan. In 2006, she was appointed by President George W. Bush to the board of the Corporation for National and Community Service. In 1992, Mrs. Cummings co-founded Lovelight Foundation in Detroit, Michigan. Lovelight was dedicated to enhancing the lives of women, children, and families through education, outreach, and funding. Lovelight was critical in improving the Detroit community, helping introduce urban gardening programs in schools, supporting holiday youth programs, providing mobile dental services for children, and creating a school “adoption” program that turned abandoned lots into playgrounds. Lovelight Foundation has since been converted to a private women’s foundation, and is now part of the Women Moving Millions campaign. Mrs. Cummings was also influential in her time serving on the Council of Michigan Foundations’ board (1996–2006), of which she was also chair (2005–2006). During that time, Mrs. Cummings helped to increase activities for the family foundations committee, instituting an annual family foundation retreat that allowed members of family foundations to gather to discuss issues and best practices while making connections with like-minded foundations across the nation. Since 2005, Mrs. Cummings has served as the managing trustee for the Max M. and Marjorie S. Fisher Foundation, a $250 million endowed family foundation based in Detroit, Michigan, that supports health, culture, Jewish life, and strengthening youth and families. The Fisher Foundation also seeks to support the rebirth of Detroit by focusing on early childhood development efforts and supporting major cultural institutions within the city. 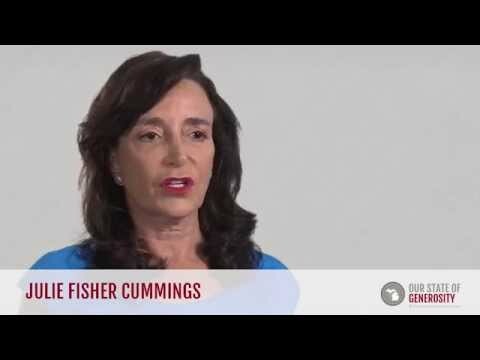 Mrs. Cummings was interviewed regarding her insights and experiences in working with Michigan’s philanthropic community and the Our State of Generosity (OSoG) partners. The following are selected quotations from her interview specifically related to the five organizing themes of the OSoG project.